We saw similar geographic trends in an Investor’s Business Daily/TIPP poll that was conducted from Nov. 26 to Dec. 2. 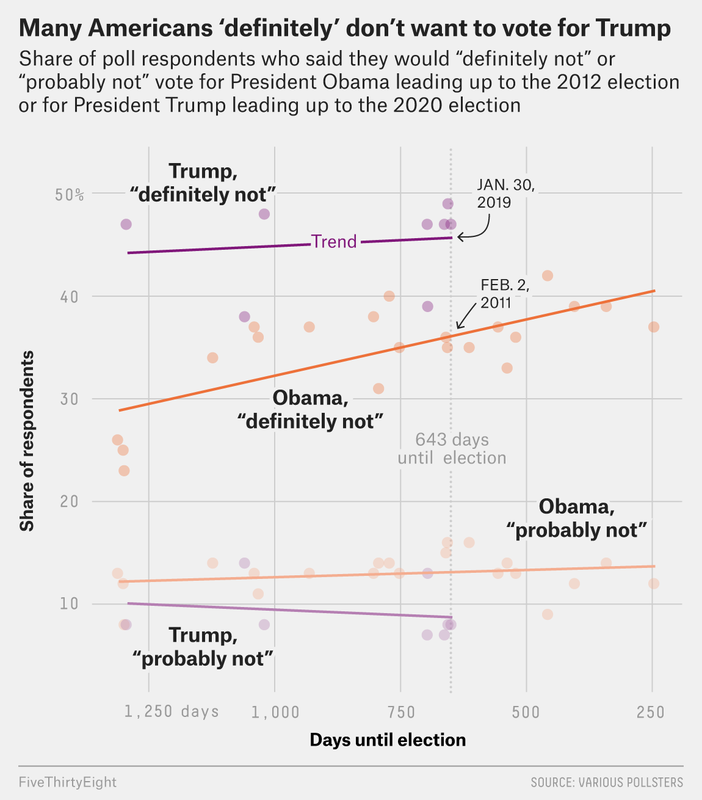 Trump again got the highest marks from residents of rural areas — a 62 percent approval rating and a 35 percent disapproval rating. And yet again, his standing took a nosedive among suburbanites and urbanites. In suburban areas, Trump’s approval rating was 32 percent, and his disapproval rating was 60 percent. In urban areas, his approval rating was 27 percent, and his disapproval rating was 67 percent. (The IBD/TIPP poll didn’t include “small town” as an option for respondents.) Overall, Trump’s approval/disapproval spread was much lower in the IBD/TIPP poll (39 percent approve, 55 percent disapprove) than it was in the Selzer poll, which explains why the IBD/TIPP poll is worse for Trump in all three geographic categories as well. A YouGov poll found that only 26 percent of Americans either “strongly” or “somewhat” approve of the way Trump is handling the fallout from the killing of journalist Jamal Khashoggi. There was a sharp party divide in responses: 57 percent of Republicans approved, while only 6 percent of Democrats did. 59 percent of Americans today either “strongly” or “somewhat” approve of the way George H.W. Bush handled his presidency, from 1989 to 1993, according to YouGov. That includes 53 percent of Democrats and 77 percent of Republicans. 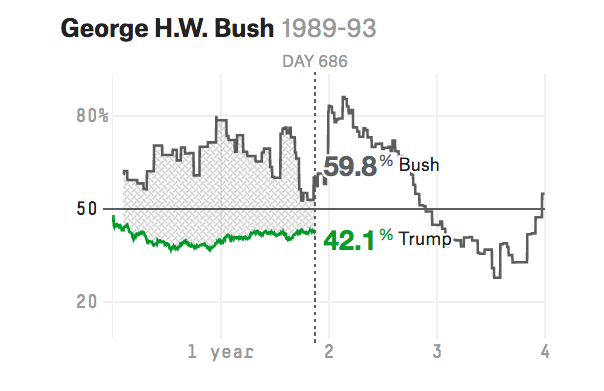 You can see for yourself how Bush’s approval rating changed over the course of his presidency using our presidential approval rating tracker. A Gallup poll taken in France earlier this year, before the riots in December over increased living costs, found that President Emmanuel Macron’s job approval had declined by double digits among the three poorest of France’s five income groups but remained virtually unchanged among the two richest groups. Americans still prefer to watch the news instead of reading or listening to it, according to a study by the Pew Research Center: 47 percent of respondents said they preferred to watch the news, 34 percent said they preferred to read the news, and 19 percent said they preferred listening to it. These habits remained mostly unchanged from 2016. Among those who would rather watch the news, 75 percent said they preferred doing so on the television, while 20 percent said they preferred to watch online. A poll conducted by The Research Moms, a group of researchers at Edison Research, found that only 15 percent of moms said they split parenting responsibilities evenly with another parent. Forty-three percent said they handle the majority of the parenting responsibilities, and 41 percent said they handle all the parenting responsibilities. The Research Moms surveyed mothers in the U.S. age 18 to 64. According to a Quinnipiac poll of New York City voters, 57 percent of New Yorkers approve of Amazon locating one of its new headquarters in Queens, while 26 percent disapprove. But when respondents were asked about the $3 billion in tax breaks that Amazon will get from the city and state government as part of its deal to relocate, support was roughly split, with 10 percent unsure. Support for Amazon is even higher in Virginia, where a second headquarters is planned. A poll by Christopher Newport University asked registered voters in the state whether they approve or disapprove of the announcement that Virginia would provide $573 million in incentives for an Amazon headquarters; 68 percent said they approve of the announcement, while 30 percent said they disapprove. The masses have spoken, determining that “Die Hard” is not a Christmas movie. That’s according to a Morning Consult/Hollywood Reporter poll, which found that only a quarter of American adults considered the Bruce Willis vehicle a Christmas movie; 62 percent said it was not, and 13 percent said they didn’t know or had no opinion on this important matter. Armenians go to the polls Sunday to participate in snap parliamentary elections, the first since the “non-violent velvet revolution” protests in April and May that resulted in the resignation of Prime Minister Serzh Sargsyan. An in-person survey of 1,100 voters conducted this week by an affiliate of the Gallup International Association in Armenia found that more than 69 percent of Armenians who plan to participate in elections said they would vote for the My Step alliance, led by current acting Prime Minister Nikol Pashinyan, followed by about 6 percent who said they would vote for the Prosperous Armenia Party. The Republican Party of Armenia, which had served as the ruling party, polled at less than 2 percent. 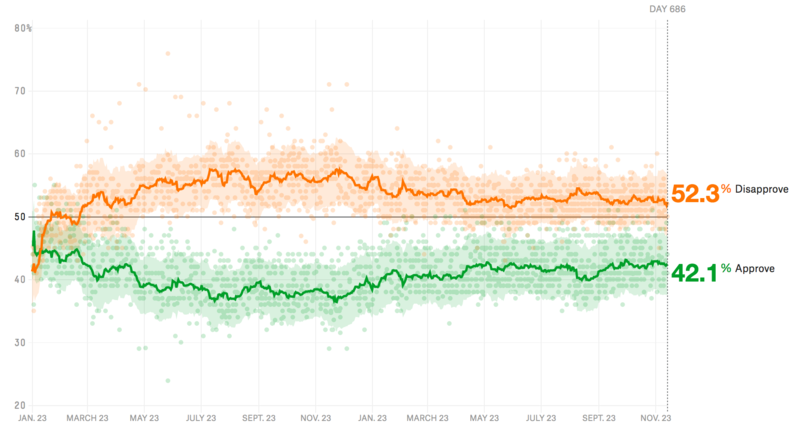 According to FiveThirtyEight’s presidential approval tracker, 42.1 percent approve of the job Trump is doing as president, while 52.3 percent disapprove (a net approval rating of -10.2 points). 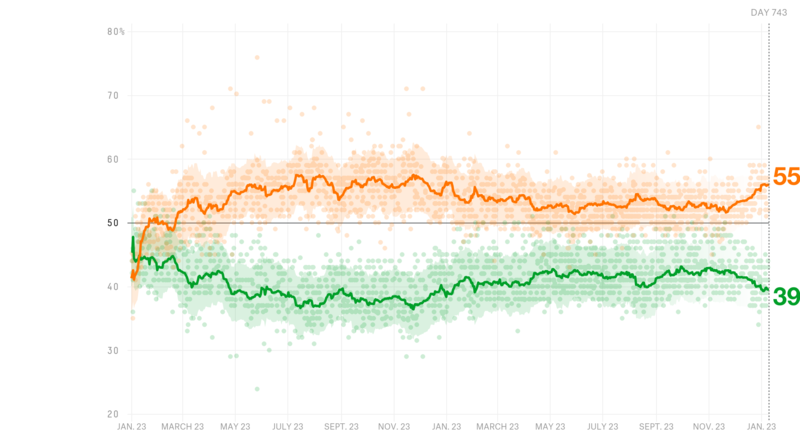 At this time last week, 42.4 percent approved and 52.6 percent disapproved (a net approval rating of -10.2 points). 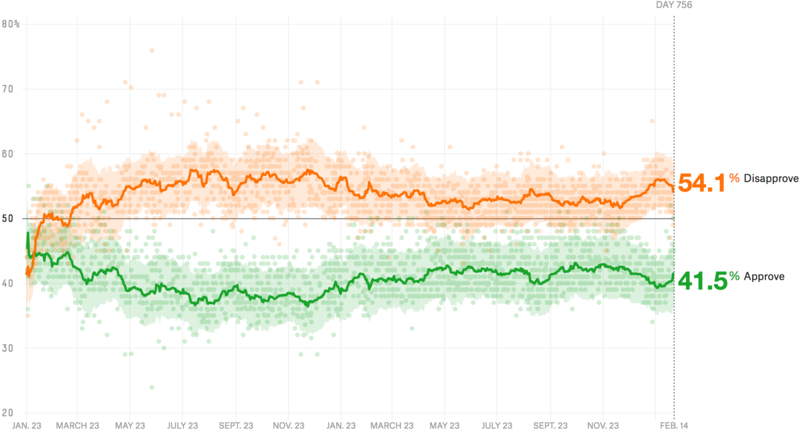 One month ago today, Trump had an approval rating of 41.8 percent and a disapproval rating of 52.8 percent, for a net approval rating of -11.0 points.